A nuclear attack can ruin your day if you haven’t prepared for it in advance. ReadyNutrition Readers, as you have exciting fun during this holiday season – meals, Christmas presents, family dinners, and such – let’s not lose focus on the volatility of the world situation. Just because Donald Trump won does not mean that the battle to restore the United States to a constitutional republic is over. There are still enemies outside of the country and enemies within; do not lose sight of these facts. Usually, this time of the year is “great” timing for either an attack or some kind of military action. Operation Just Cause in Panama (1989) was kicked off right around Christmastime. Same for both Desert Shield and Desert Storm (’90 and ’91). The nonsense always starts around this time of the year. There are reasons for it. The harvests are in, and there’s not a lot a civilian population can do during the winter to counter an invasion without great cost or discomfort. 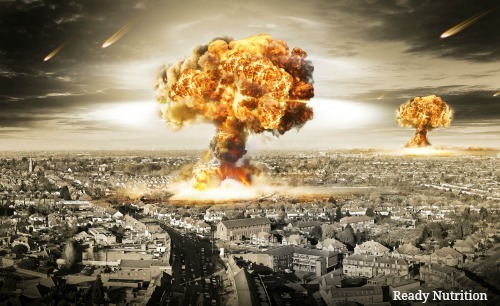 The next world war will be initiated by an EMP device/weapon detonated over the continental U.S., followed by a limited nuclear exchange and war with conventional forces. I stand by it because it is better to be either “wrong” or “late” in a prognostication 1,000 times than to be right (and unprepared) just 1 time. In this regard, here are the basics for preppers and survivors out there who understand that vigilance is not paranoia. Here are the basics concerning a nuclear attack. Heat (Thermal Effects) – The severity of the thermal effects will depend on your location. If you are at ground zero of the blast or within a mile of it? It was nice knowing you. 2-5 miles of it, and you’ll probably be subjected to an intense fire wave and not survive it. 5-10 miles out, a lot of buildings and trees will be on fire, and you can receive burns on exposed skin, as well as retinal damage from the initial explosion’s excessive flash (flash burns can be either temporary or permanent). Overpressure – a large increase in air pressure far above what is considered normal. Within six to seven miles of the explosion, the “wind” speed can be between 90 to 120 miles per hour when the dynamic pressure component of the blast wave hits. It would not be good to be out in the open, and you would also be exposed to things picked up by this wind and hurled at you. Light damage would be sustained by buildings and structures about 15 to 20 miles from the blast. 5. Radiation – all the radiation is produced within the first minute of the explosion. An unprotected person within a couple of miles would be exposed to radiation in amounts that he or she could not live for long if initially surviving the heat and blast effects. Then it takes about 24 hours for the remaining fallout to come back down to the earth. Fallout is particulate matter (such as dust and dirt particles) sucked up into the fireball that “fall” back down to earth. This applies in a ground-burst weapon, as airburst explosions detonate above a city and are the most “efficient” method to take it out, leaving a minimal amount of fallout. With radiation, other factors such as weather and wind patterns must be taken into account to find the pattern of drift. Usually, 3 weeks to a month in a shelter will enable the majority of the particles to deteriorate to livable levels. Radiation comes in several different types. Alpha particles are larger and attach themselves to debris. They can be shielded against by clothing and brushed off, posing a danger only if they are inhaled, ingested, or enter through the skin such as in a cut or a burn. Beta particles are also able to be kept off with thick clothing. If Beta particles touch the skin, they will burn you, and can penetrate the skin. Beta particles also can pose a problem if inhaled, ingested, or with entry through a wound or burn. Gamma rays are very dangerous. They go right through you and into you without protection from shielding. Signs and symptoms of radiation poisoning are as follows: nausea and vomiting, malaise (overall weakness and sickness), blisters/ulcers of the skin, excessive visual disturbances, dizziness and vertigo, and excessive bleeding from minor and major wounds. Also, keep in mind that radiation received is cumulative: a fatal dosage usually runs about 300 rads/roentgens or higher, but if you receive 200 at one exposure, you’re not safe with another exposure of 200, as it adds up to 400. You need a survey meter (Geiger Counter) and a dosimeter to keep track of such exposures and the radiation received with them. There are numerous sites and resources available to you on the Internet that will provide tables of thicknesses and degrees of protection for the various components of your shelter, whether field-expedient or planned. The general rule is that the denser the material (such as steel and concrete, as opposed to soil, or wood) the better a protective factor it will render. Mass and density are the two factors that will help to shield you from radiation. The third is time, as radiation does decay rapidly with the exception of isotopes such as Strontium-90 or Uranium-238. Your best protection is (of course) distance from the bomb…as much as possible, as well as shielding in a shelter with supplies and necessities gathered within that shelter beforehand. To cover all the information you will need is beyond the scope of this article, the intent of which is to give you “food for thought” if you haven’t already taken such a thing into consideration. To summarize, a nuclear attack can ruin your day if you haven’t prepared for it in advance. When you look outside your living room window and find that the snowman has melted, the wicker furniture on the porch is on fire, and the chestnuts on the tree are roasted, along with the tree itself…that is a little too late. As with any disaster natural or man-made, the time to prepare is before it happens and keeping in mind that complacency can kill you. The disasters strike just when you think they will not, or at a time when everyone is at the dinner table having a grand time. Be prepared with your supplies and in your mind and heart. Keep fighting that good fight, and take care of one another. JJ out! A nuclear war will see many, many megaton explosions – only one is needed to destroy half of Massachusetts. There is no such thing as getting prepared for something like that. Stop getting your info from the movies. Ah excuse me. You’re the one in la-la land if you think there’s such a thing as nuclear war survival skills. I’ve seen nuclear war assessments from both Stanford and MIT physicists, and to say that the world would be toast is putting it nicely. Even if you did survive the initial blasts, the radiation contamination and nuclear winter would do you in. You are the one that needs to do some reading, like on the effects of a 10 megaton detonation about a mile above the ground.